Bookmans honors the inner Trekkie, WOWer and Dungeons and Dragons master in all of us. 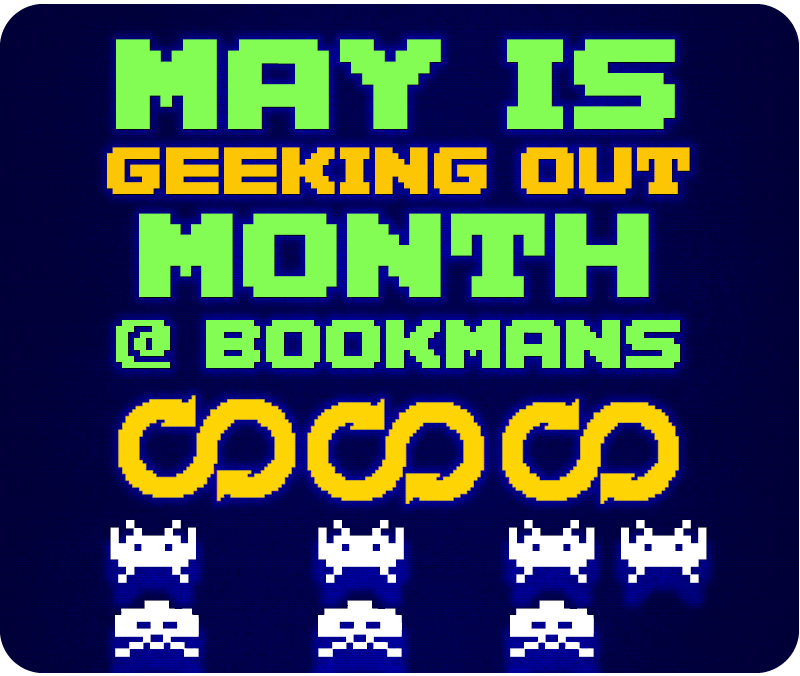 Geeking Out month is a time to dust off those Whovian T-shirts, Millennium Falcon replicas and all the in-depth Zelda trivia you have rolling around in your noggin and head to Bookmans for wholesome, geektastic fun. We all know Geeking Out Is Half The Fun. If you’re a Melee connoisseur or a cosplay Casanova, wipe the fog from your glasses and pay attention because Bookmans Entertainment Exchange is where you want to be. Claim victory at the Super Smash Bros Melee Tournament taking place at Bookmans Ina. Bookmans Speedway flies their geek flag with Game Geeks!, the ultimate competition for gamers. Make and take a BB8 or take up the Solo swagger for top prizes at May The Fourth at Speedway. Celebrate Free Comic Book Day at the Comic After Party. Bookmans Grant gets in on the May the Fourth fun with a build your own lightsaber station and viewing of the cinematic cliffhanger known that is The Empire Strikes Back. Streetpass AZ once again stops by for the 3rd Friday 3DS Meet Up and retro gamers flood the store at their Melee Tourney. Geek Out at our Mesa store with Brittany Ward, author of A Planet-Sized World Layered in the Brain, and graphic novelist and artist Danielle Pajak, author of Elijah: A Graphic Novel. The long standing tradition of Bookmans Phoenix’s Star Wars Party Weekend continues with a galactic costume contest and pool noodle lightsabers. Hang with Phoenix Astronomical Society at Super Science Heroes: Rocket Riot. Bookmans Flag kicks off Geeking Out month with a Star Wars Originals marathon at their May the Fourth event and Free Comic Book Day at Cab Comics. Become the ultimate geek champion at the second annual Geek Games. Like what you like with no apologies. Even if that is Kirk/Spock fan fic. We support you all the way.